1. Preheat the oven to 190º C, 375º F, Gas mark 5. 2. Heat half the oil in a pan and gently sauté the onion and garlic until golden, then place in a medium sized mixing bowl. 3. Add the next four ingredients and mix well together to create the stuffing. Divide into four and fill the mushroom caps. 4. Use the remaining oil to grease the base of a roasting tin. 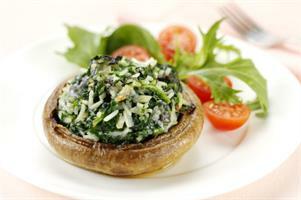 Place the mushrooms in the tin and bake in a pre-heated oven for 15-20 minutes until cooked.